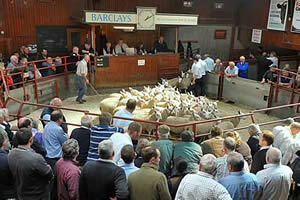 The Cumberland & Dumfriesshire Farmers Mart had forward 9,406 Store Lambs (including 2,742 Cheviots & 2,380 Blackfaces) at their Weekly Sale at Longtown on Tuesday 25th October, 2011. An excellent show attracted the usual large company of buyers with trade again at a premium. Top of £78.50 for Texels from Greenknowe, others £77 Lustruther, £73.50 Routin Lynn; North Country Cheviot £77 East Murton, £76 Linton House; Beltex £76 Greenknowe; Suffolk £76 Linton House, £73 Branxholm Braes, £72.50 Risehead; Lleyn £71.50 Southdene; Charollais £68.50 Hallburn; Greyface £62.50 Townshield, £62 Lochwood, £61.50 Tecket; Swaledale £42.50 Sheepriggs, Bayles and Dollard. Cast hill ewes to £60 Barrowburn. Another large show of Cheviots sold very well with a top of £67 Granton, £63.50 Priesthaugh, £62 Skelfhill. Blackfaces still in strong demand. Top of £69.50 Greyside, £68.50 Sewing Shields, £67.50 Horseholme, £64.50 Chapel House.